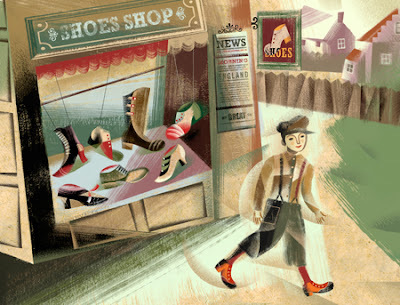 "In a small village in England," Charlie's grandfather, a cobbler, made Charlie a pair of leather shoes. "The shoes were well made and comfortable, and Charlie was proud of them." When Charlie and his brother were young boys, they moved with their parents to work in a city textile factory. Gyeong-hwa Kim tells the story of Britain's Industrial Revolution, with its polluted air, and harsh working conditions for children and adults alike. It is also a story of a sacrifice that Charlie is willing to make for his sick mother. Illustrated by Anna and Elena Balbusso, the book has a handsome cubist/constructivist style reminiscent of Marc Chagall. With a map of the global economy and a timeline of events, Leather Shoe Charlie works as both a picture book and a history book, with present-day relevance. Thank you to Eerdmans for the review copy.